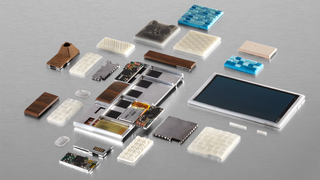 Time has taken a deep dive into Google's modular smartphone, revealing some interesting details along the way. Work on the concept, which follows on from R&D by Phonebloks and Motorola, remains at Google because it kept hold of the Advanced Technology and Projects group when it sold Moto to Lenovo. It seems Google has ambitious plans for it, too. The Time feature explains that its current plan is to create a "grayphone": a barebones, customizable exoskeleton that initially comes with little more than a screen, a frame and a WiFi radio. The devices should only cost $50 and will be "designed to be sold at convenience stores". From there, users would be able to customize their device however they wanted. In fact, the upgrade path sounds quirky, too. An on-board app will allow users to tweak soft design elements, and Google's Paul Eremenko told Time that users would rock up to special kiosks to upgrade the physical components. Those kiosks will be designed to fit into shipping containers to be sent around the world, and will contain parts and tools so users can tweak their devices.